To ride a tandem bicycle requires coordination, collaboration and communication between the riders to get to their destination. In the same way, to use climate information in adaptation planning requires coordination, collaboration and communication between scientists and decision-makers. Climate in Tandem will offer guidance for providers, intermediaries and users to collectively design climate services for policy and practice. The Tandem guidance will steer people towards information they can use: the latest and most relevant tools, data, methods, approaches, and case studies. Explore the Climate in Tandem online guidance > Coming soon! Climate in Tandem is designed to offer a way for climate service providers, intermediaries and users to better navigate tools, data, methods, approaches, and case studies. The goal is to improve the design of climate services, so that services are decision-relevant and tailored to users' needs. The guidance specifically aims to increase the use of climate information in adaptation decision-making, and to build coordination, collaboration, communication and capacities of providers, intermediaries and users. Built on the weADAPT.org platform, the guidance draws upon resources contributed to weADAPT by the adaptation and climate services communities, and curated by the weADAPT team. Climate in Tandem organises relevant resources, and the types of questions and considerations that are useful to ask during the design process. This supports multidisciplinary teams so that they can work together to develop an effective services. The process involves three key stages: Scoping, Co-Design, and Uptake & Use - These stages link to four cross-cutting themes: Communication; Capacity Building; Monitoring, Evaluation and Learning; and Funding. Climate in Tandem is in the early stages of development. We are in the process of adding various additional functionality that tailors the resources to individual roles and contexts. To make this tool as useful as possible, we need your feedback and support. Take the Tandem for a spin (coming soon!) Let us know what you think. Find contact details below. Provide feedback and add your resources! Climate in Tandem is a new tool. We will continuously work to improve its functionality and content to incorporate the most recent research, practices, technologies and experiences from the field. We welcome your feedback on the guidance, and we would be glad to include new resources relating to climate services. 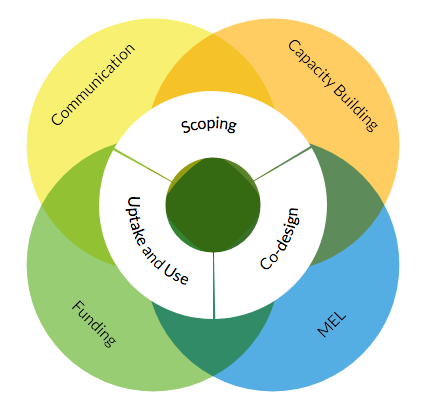 The Climate in Tandem guidance is an output of the SEI initiative on Climate Services and features relevant resources contributed to weADAPT by authors and organisations.